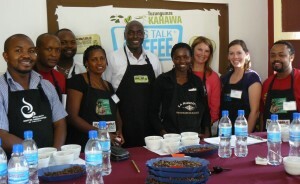 The second annual Let’s Talk Coffee® Africa was held in Moshi, Tanzania on September 5 and 6, 2011. The conference brought together actors in the coffee supply chain including, producers, cooperative leaders, cuppers and Christy Thorns from Allegro Coffee to discuss how the changing market is impacting the industry in East Africa. The event opened with Adolph Kumburu, Executive Director of the Tanzanian Coffee Board, commenting on how Let’s Talk Coffee® strengthens both the coffee industry throughout East Africa, bringing transparency to commercial relationships. The theme of transparency was highlighted in the next presentation, given by Sara Morrocchi, Sustainable Harvest Africa Program Director. Her presentation concentrated on the Relationship Coffee Model, now and throughout 2012. It included an interesting and innovative slide that broke down the price of a standard bag of coffee by showing the price that each actor in the supply chain receives. In keeping with this year’s theme, Thriving in a Changing Market, we welcomed Katie Gilmer, Sustainable Harvest's® Relationship Coffee Manager from Portland, Oregon, to present current market conditions, what affects these conditions, and how producer groups can protect themselves in a volatile market. She introduced open contracts as a way to help producer groups protect themselves against this volatility. The impact of this presentation was profound, and many participants were eager to learn how to manage open contracts. The latter part of the first day was spent in a Price Risk Management Workshop headed by Sustainable Harvest® staff. This practical element provided hands on-experience to participants in the areas of determining how world events affect the coffee market, the details of an open-contract and finally placing market orders based on these open-contracts. This innovative training was appreciated by all participants and comments such as; “this gives us the confidence to fix our contracts” and “this is something that all groups will benefit from” were heard at the closing coffee break of day one.